In a new weekly segment, NBC Chicago teams up with Chicago chefs for a lesson in cooking. This week, chef Armando Gonzalez, of Libertad in Skokie, shows us the best way to prepare veneras, or scallops. 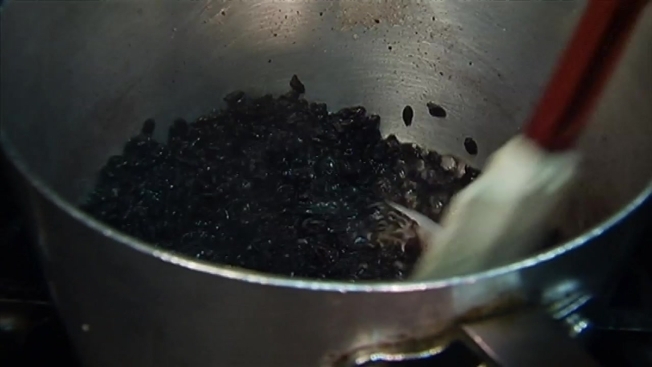 For Rice: Place 4 cups of water in a pot with the black rice. Bring to a boil and leave for a total of 30 minutes, or until soft. Drain water, put back in pot and add 1/2 tbsp. of butter and salt and pepper to taste. For Sauce: Add yuzu juice, sugar, heavy cream and deveined habanero pepper to pot. Boil for about 2 minutes, until thick. Add 1/4 pound of butter, little by little, while whisking it in. Strain. For Green Beans: Cut tips of green beans off. Bring 1/2 gallon of water to boil. Drop green beans in and leave for 5 minutes. Remove them from water, and let cool. Tie them in a knot. For Scallops: Heat pan until hot, and add 2 tbsp. of oil. Sprinkle salt and pepper on both sides of scallops. Place scallops on pan for about 1 minute, until brown. Flip over and do the same. Remove from pan. Add green beans and saute lightly while adding a pinch of salt and pepper. For Plating: In a bowl or plate, place rice in the middle. Spoon the sauce around the rice, place the scallops over the rice and the green beans in between the scallops.